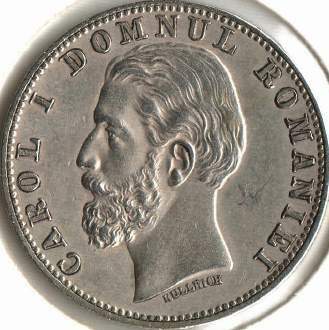 denomination "2 L", ROMANIA, year 1881, Romanian coat of arms, letter V standing for Vienna mint and wheat ear, the sign of Romanian mint, outer pearl circle inscription "CAROL I DOMNUL ROMANIEI" meaning "PRINCE OF ROMANIA" and CAROL I head facing left, outer pearl circle. Under the neck lies KULLRICH, the engraver's name. 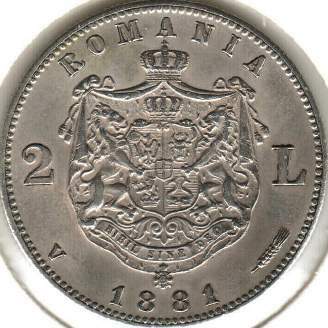 The uncirculated 2 lei 1881 coin pictures above and the detail below are present on Romanian coins through the kind permission of Mr. Radu Lissner. Premiere: 2 lei 1881 "with wrinkles". The wrinkles are very similar to the ones on 5 lei 1881 DOMN or on 100 lei 1943. The coin has 4 wrinkles, clearly visible as linear proeminences, that appeared due to 4 notches on the die. 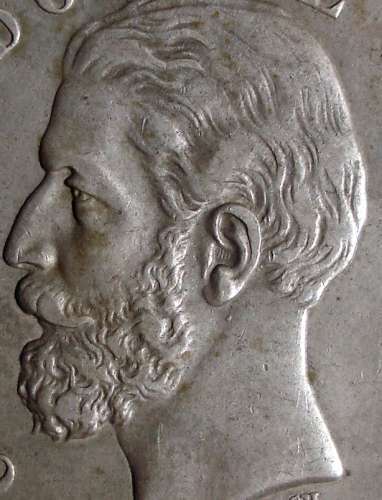 The "wrinkles" appear in the ear, in the deepest zone of the coin. It is clear that is not a striking error. 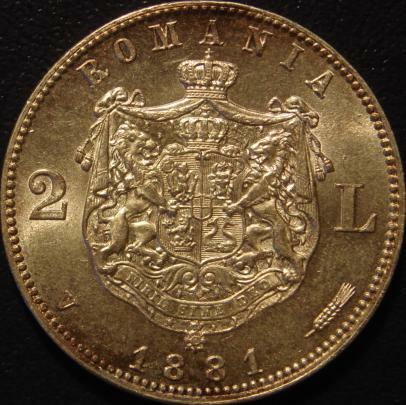 Because all 2 lei of 1881 coins were minted in Austria-Hungary, at Vienna, we can conclude that the "wrinkle fashion" came to Romania from Austria! 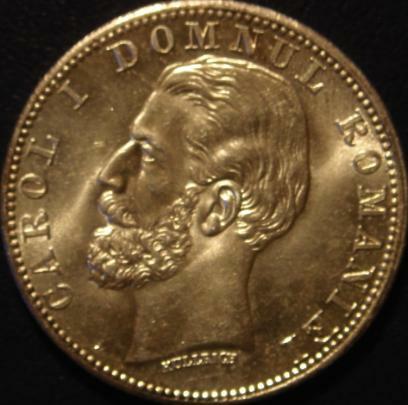 The coin presented below belongs to the G.F. collection, Germany.